Go to http://docs.google.com/ and click on "Create new"
Please make sure to use only the titles listed above. 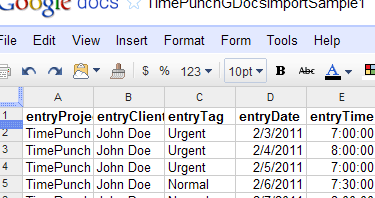 If a column is not properly titled, all the values in the column will be ignored. Enter the entries from the second row. 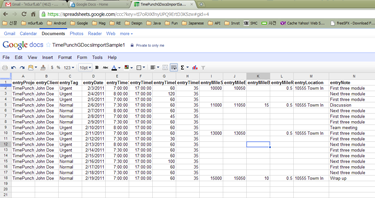 Each row will become one entry and Texts in each columns are imported to corresponding fields. When entering the data, please make sure the following data format requirements. All the date values should be in "YYYY-MM-DD" format. All the time values should be in 24 hour "HH:MM" format. 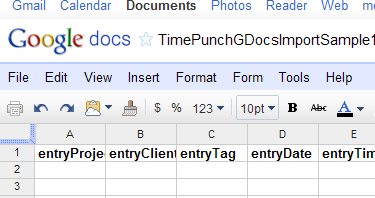 The value in "entryProject", "entryClient" and "entryTag" should match to the existing ones in Time Punch. Otherwise, new prject, client and tags will be created. In case, the project column is left blank, the entry will be imported into "Imported" project by default. 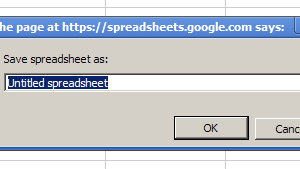 Save the spreadsheet by clicking the "save" button. Before leaving the screen, please make sure in which worksheet the entries are saved. 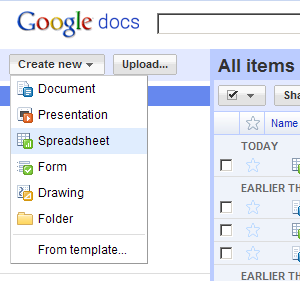 You can find the worksheet name at the bottom of the spreadsheet. Now, your job is done in Google. Let's go to Time Punch and start the import. 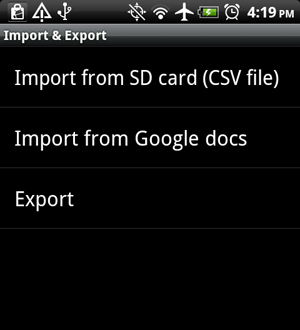 "Import" options are located in Time Punch Main > MENU > Settings > Import & Export. Press the worksheet you saved your entries. Then you will see your entries. You can import either (1) individual items or (2) all entries. "Import All" Button will import all the entries at once. For individual items, press on the entry item and select "Import" button.